This is the second of two web pages about finding the major pentatonic scale-tones. Make sure you've worked through the first page, with the method, and the all-white-key pentatonic scales, before tackling this one. The scales on this page are grouped according to how many black keys they use (in each octave). There are two of each. This exercise - working through the 'construction' of the pentatonic major scale - is as much for your ear as for your brain. Let the sound of the pentatonic scale sink into your musical consciousness and hum or sing along with the demonstrations. You notice that the pentatonic major scale always uses one fewer black keys than those shown in the key signature. This is because the pentatonic major scale doesn't use the fourth or the seventh scale-tone - both of which always feature in the flat- and sharp-key key signatures respectively. G flat (six flats in the key signature) is where the flats meet the sharps - it can equally well be called, and written as, F sharp major (six sharps). 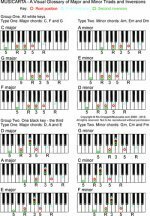 With five black keys, the G flat pentatonic major scale is difficult (but not impossible) to play. Work it out anyway, for completeness' sake. Now that you understand how the pentatonic major scale is 'put together', go on to the Build-up of Tones drills to start working up some more flexible command over finding and playing the tones.